Welcome to the MapImagery Encryption on-line Help. This Help file provides the basic information you need to start using MapImagery Encryption. MapImagery Encryption is a set of tools for creating and using encrypted ECW imagery files. MapImagery Encryption allows imagery to be distributed publicly, for example on DVD, CDROM, intranet file system, or via the Internet. But only to be viewed by users with an appropriate key. Optionally it is also possible to specify that the imagery can only be decrypted using a particular software product, or even by a user with a particular network address. The encrypted imagery files created and used by MapImagery Encryption have a .MIE file extension. 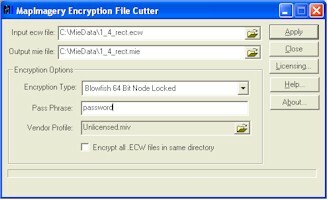 The MIE format, developed by MapImagery Limited, is an encrypted form of the ECW wavelet compression format, consisting of a simple header containing metadata, and a body containing the encrypted ECW data. MapImagery Encryption key files have an .MIK file extension. ECW is a wavelet compression standard developed by Earth Resource Mapping that provides high quality image compression. Many data and software vendors are adopting ECW as their standard image compression technique. Decryption of MIE files are done on the fly so that the imagery is not left as temporary files on the users hard disk. By combining both ECW compression and MIE encryption seamlessly, MapImagery Encryption provides an extremely useful solution for data and software vendors, wishing to distribute proprietary imagery, in a controlled way.